At NuFlow Oklahoma, we offer a wide variety of innovative services that restore, improve, and maintain optimum sewer flow and strong water pressure. We can repair leaks, replace broken sections of pipe, clean away roots and buildup, and monitor the pipe condition, all without the need for heavy excavation equipment. Our innovative solutions make sewer repair and maintenance fast, easy, and most importantly, affordable for every budget. Prior to conducting repairs on sewer and drain lines, we have modern sewer camera inspection technology, including a new system that combines a durable camera with fiber optics to allow us to see inside inaccessible drain pipes and sewer fixtures. With this tool, we can ensure accurate diagnostics, provide a report of the system to show signs of age, perform sewer mapping for renovation projects, or help with new-construction pre-inspections. For pipes that are obstructed or draining slowly, NuFlow Oklahoma offers hydro jetting service. This eco-friendly drain cleaning method uses clear water to pressure wash the insides of sewer pipes, removing grease, mineral, and waste buildup and breaking up clogs. It also clears away tree roots that have worked their way in around the joints during drought. If you’re struggling with significant pipe problem that requires a major repair or even possibly needing the pipes to be replaced, our team at NuFlow Oklahoma can repair your sewer line with our patented pull-in-place cured-in-place pipe (CIPP) lining process, an advanced repair method that essentially installs a new pipe inside of the old one while still increasing sewer flow efficiency. The secret is our uniquely-engineered, high-strength epoxy, which is sturdy enough to create a new pipe form while still curing quickly enough to reduce the impact on the customer’s daily activities. To apply the CIPP, an expert NuFlow Oklahoma technician covers a specialized liner with the epoxy resin, which is carefully folded and pulled into the pipe through easily accessed points, such as a cleanout opening or a pipe terminus. The liner is positioned in the pipe over the damaged areas and inflated, pressing the epoxy against the interior of the pipe to form a new, perfect pipe against the damaged pipe’s interior wall. The epoxy cures for several hours until it becomes ultrahard, then the liner is removed to reveal the smooth, perfectly round CIPP. This new pipe resists root penetration, extreme weather damaged, corrosion and rust, so it lasts for several decades. If the damage is less pervasive, such as a small leak or minor corrosion, the pipe can be restored with our unique epoxy coating. This pipe lining method is similar to the CIPP method, but the epoxy is liquified and applied with pressurized air rather than with a removable sleeve. Our epoxy coating can be used for smaller pipes than CIPP, such as small copper pipes and HVAC piping. It is safe for drinking water, as well. NuFlow Oklahoma has the most advanced sewer repair techniques to afford our customers with effective solutions at affordable rates. 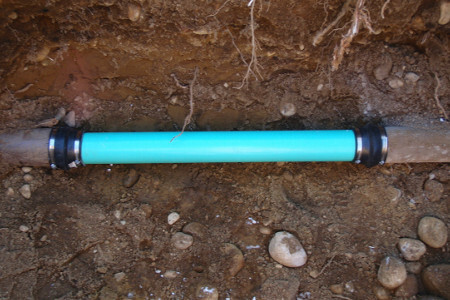 We can seal leaks, restore pipes, and clean out buildup without the need to dig. Call us today to learn more!